In this tutorial I will show you how to save sensor data remotely with Arduino and Node.js. We will accomplish this with Arduino, Ethernet Shield and computer/server. The basic idea is to set up UDP stream from arduino to remote computer where we have Node.js udp server writing data into a file. 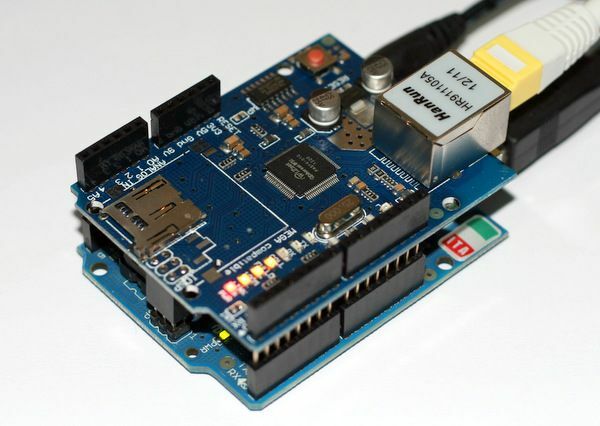 Put the ethernet shield on the arduino and plug in the ethernet cable from your network. Connect arduino to your computer with usb cable and plug in additional 9V power adapter to make sure that shield will have enough power. You are all set and should be looking at the same thing as seen on my photo. In arduino sketch we have to set up the UDP client. We will read the value of the sensor with analogRead and convert it to byte array before sending it out with UDP packet. In my case I’m sending data to ip 192.168.1.135 which is my computer and I’ve chosen port 6000. To install Node.js on Windows go to nodejs.org press the big green “Install” button and after you get the file run it. Now we need to write an UDP server which listens to UDP traffic on port 6000 and writes to file. The code below is all you need. Save it to udpwrite.js file. We have the code but the Node.js USP server is not running jet. Easy way to run the code on windows is to make a bat file go4it.bat containing a line of code below and save it in the same folder as udpwrite.js file. If you check your folder where you have go4it.bat and udpwrite.js you will see there is a new file mydata.txt. If you don’t see it press F5 to refresh. To stop recording click on the black console window running Node.js and press Ctrl+C and then Y.